Anthony Williams – When even 280 characters just isn't enough. When even 280 characters just isn't enough. I was never the best at portion control when I was cooking for two, and when I was cooking for just me, it was even harder to get things just right. I’ve always loved food – both making it and eating it. “Your eyes are bigger than your belly,” was often Mom’s refrain. It was never a problem when I went to school and sixth form, or even when I started working at the local supermarket while I was at university, because I walked everywhere and caught the bus. Of course, the minute I got a real job, my appetite remained the same, but my arse would be mostly sat on an office chair and, physically, I’d be rather more sedate than I had been previously. And, of course, the minute I got a car instead of walking to and from the bus stop, well that’s when my portion control – or, rather, lack thereof – turned into a bit more of a problem. For a good few years, my exercise regime included going to karate classes at least twice a week, and teaching at least once a week. In the run up to getting my black belt and taking part in the club’s “world cup” event in Australia, I was training four times a week, and yet still, I wasn’t losing weight, but rather maintaining it1. Even when I got my black belt, I was 16st 2lb (226lb or 102.5kg), and it wasn’t going anywhere. When I cook, especially when it comes to rice, noodles, pasta or potatoes, I will often cook a little more than I need to, because while 2½oz of pasta is probably enough for me, it never looks like it’s enough. There go those bloody eyes again. It’s been nearly 5 years since I put my Gi on with intent, and so my exercise in the last few years has mostly been restricted to walking and the (very) occasional run. In reality, I haven’t run in anger for nearly 6 months. My weight peaked at around 16½ stone (105kg) throughout the course of the last 18 months, so it was fairly clear that I needed to do something about all the food I was eating. So I started trying a couple of the food delivery services that are available. The fixed portion sizes meant that I was actually doing a better job of watching portion sizes, but also meant that I was taking lunch to work and remembering to actually eat. Given recent events, it’s probably not a surprise that my weight has been falling since around this time last year. Some of that was down to me watching my diet, but the majority was down to the stress and the fact that I was often simply forgetting to eat. In the vast majority of cases, I would try and make sure that the boys ate as soon as they got in, which would often mean they’d eat differently to me. By the time I’d got them fed, bathed, read them stories, put them to bed and finished doing the various chores around the house, it would often be after 9pm, and the last thing I wanted to do was think about what I was cooking. This is where HelloFresh and Gousto really came in handy. Both of the services featured good food, with recipes that were relatively easy to follow and with ingredients that, for the most part2, were pre-portioned and ready to simply throw in a pan and cook. Both services are very, very similar in terms of the amount of recipes available, the quality of the food and ingredients and the results you can expect. It’s worth noting that I enjoy cooking and eating new things, so it was also a way to get me out of my comfort zone to try cooking new things. Granted, it’s not going to inspire me to craft new masterpieces3 but it has definitely been a way to help me drown out the repetitive and often boring meal choice rut I’d managed to get myself into. Over the last few months, the second portion that would ordinarily become my lunch for the following day has started to end up on another plate, and with my life being in a far better place these days, I’m happy to say that there aren’t many nights when I’m cooking for one any more. So now I have a bunch of new recipes and, more importantly, a shopping list of ingredients that I can use to prepare dinners and lunches. Combining it with trips to the local butcher instead of the local supermarket for my meats, it can make it pretty cost effective too, and on the occasions when I’m cooking for more than just me and the girlfriend, it’s bringing a whole new bunch of things for the kids to try. Over the years, I’ve personally tried HelloFresh, Gousto and Riverford Organic’s boxes. I quickly became bored with Riverford’s offering after a particularly lengthy spell of kale-based recipes grated on me, and their recipes were downright difficult to follow. I’ve also heard of boxes from The Mindful Chef and Marley Spoon, but haven’t had a chance to try them out just yet. We’re giving Gousto another try at the moment – you try turning down an offer of a free bottle of Prosecco – but we’re planning to give the others a go in the future. The Six Nations tournament is finally going to trial the bonus point system, as used in the English Premiership, with a slight tweak to ensure that Grand Slam winners can’t lose out to a second place team. The bonus point system, introduced for the 2003 Rugby World Cup and used throughout international and club competitions around the world ever since, was devised to reward attacking play, encouraging teams to win games through the scoring of tries rather than through kicking drop goals or penalties. Over the course of a 22-game season, the number of bonus points can have a significant effect on the outcome of the competition, and having been to premiership games where the result is all but assured, it’s fantastic to watch teams still pushing towards the end of the game, and sometimes after the clock has run out, to bundle the ball over the goal line to score the all-important bonus point try. The notable exception to the international competitions that use it has been, of course, the Six Nations. Throughout the years, there have been many calls for the Six Nations to implement the bonus point system, but those who argue against the system point to evidence that suggests it would have had little to no effect on the tables from previous seasons. This is a bit of a moot argument since, if applied retrospectively, you’re awarding bonus points based on games that were not influenced by bonus points. There is no way to know whether the bonus point system would have affected previous tournaments based on the results of games that were played under rules that didn’t promote attacking play. So, thankfully, as announced earlier today, the 2017 Six Nations will finally introduce the bonus point system, across all three championships (The RBS 6 Nations, The Women’s Six Nations and the U20s Six Nations), with a slight tweak to ensure that those who win the grand slam can’t end up losing the tournament. Grand slam winners, tournament losers? It’s worth pointing out that the nay-sayers had one thing right: the bonus point system would mean that a team could, theoretically, win the grand slam, but fail to win the tournament. Additionally, teams can only score a maximum of 5 match points. The solution the Six Nations Council has come up with, which I wholeheartedly agree with, is really, really simple: award 3 additional bonus match points to the team that wins the grand slam. That way, in the exact same scenario above, England would still win the Championship and the Grand Slam with 23 points. There are also those who suggest that the five-fixture format means that there is always an imbalance of home and away fixtures. For the 2017 campaign, England and Scotland will both have three home fixtures, while Ireland and Wales will have just two. In 2018 (if no new teams are introduced), that reverses. Once again, there’s a solution to be had here too, though a somewhat more controversial one, that would involve increasing the number of teams in the championship to seven. Right now, if you had to pick a union to include, it would almost certainly be Georgia or Romania. Relegation to and promotion from the Rugby European International Championships is something that could also be considered, though it’s a tough subject to approach. Expanding the format to seven teams would almost certainly require this, but it would almost certainly mean that the likes of Italy and Georgia would be battling it out each year to avoid the drop back into the lower tiers. Adding the bonus points system to the Six Nations is hopefully going to inject a sense of urgency into the games, to make sure that they’re as exciting as they can be. Adding more teams, introducing promotion and relegation and, ultimately, opening the game up and exposing rugby union to more countries around the world is surely a good thing. If you fancy going to a game sometime, let me know! Remember that time when I said I was writing again and that I planned to keep writing? You should know two things: my wife has left me, and I’m fine. This time, it was about as huge a chunk of my life as possible that got in the way. After almost fourteen years together and nearly 7 years of marriage, my soon-to-be-ex-wife decided she wanted to leave me. After trying to find a way to save the marriage, it became apparent that things weren’t going to work and, having lived separate lives for the last few months, we separated in August, and recently began sharing our time with the boys. There are a few things left to sort out but, to put it bluntly, we’re done. Retreating from the day-to-day social networking and blog writing scene, while the whole thing was still playing out, felt like the best thing to do, as juggling the task of keeping my emotions in check and maintaining my standards of work felt like enough to endure, without having to explain and go over my situation a number of times. Doing so gave me the time and space necessary to sort my head out, come to the natural conclusion that my relationship could not be saved, and give me time to adjust to my new version of normal: that I am now a separated, soon-to-be-divorced and single parent of three, living in a house on my own half of the time. My closest friends and family, who have known from the point at which it became apparent that there was no going back, have been nothing short of amazing, and have helped me along the road to rediscovering myself and coming to terms with the situation I now find myself in. In any case, as those of you who follow me on the various social networks out there will know, I’ve recently emerged from my self-imposed social hibernation and have started taking the tentative steps towards being active in the social sphere again, so it seems right to start writing again. Ronald Dahl’s follow-up to Charlie and the Chocolate Factory might just be my children’s first experience of what a disappointing sequel looks like. I really, truly enjoy reading bedtime stories to my kids. Every night that I can, I read to them, and have done since they were all babies. The wife and I try our hardest to make sure they see that reading a book can be just as enjoyable as kicking a ball around the garden, building things with lego, or playing Minecraft on the iPad. There’s also a part of me that likes making up voices, putting on a bit of an act, and generally watching my boys smile and laugh as they rub their eyes before going to sleep, and it’s also a great way to give my oldest the chance to flex his reading muscles and read along with me. We have our favourites, which get rolled out every few nights – The Gruffalo and The Gruffalo’s Child, A Squash and a Squeeze, Don’t Wake the Bear, Hare, and Do Not Enter the Monster Zoo are all stories that I’ve read through enough times that I can either recite them from memory or, at the very least, muddle my way through. The boys often refer to these as my “invisible books”. My oldest is nearing the final term of his second year at infant school, and his reading prowess has come on in leaps and bounds. As he’s been getting better and better, we’ve graduated from the staple picture books and stories that he loves and started moving into what he sometimes refers to as “proper books”. So, at the weekends, we usually go into stories that are a little more long-form and, after being given Charlie and the Chocolate Factory as a Christmas present, it made sense to start with Roald Dahl. Sure enough, the boys loved the book so much that I’d be asked to carry on with the story instead of reading the shorter books and, once we finished the story, and the boys discovered that there was another story about Charlie to be had, we moved onto Charlie and the Great Glass Elevator. After a rummage through my old book collection, I noticed that I didn’t own a copy, and so started telling the boys about the story from my memory, glossing over the details and avoiding any major plot points so as to avoid the spoilers. It’s worth repeating the exercise yourself, so stop reading for a second and have a think about what you remember about the book. Go on. I’m not going anywhere. I’ll wait. I’d told the boys that the story was about Charlie returning to the chocolate factory, the unintended diversion they’d taken to get there, the interesting characters that they met along the way, and the strange situations they found themselves in. All very vague, and quite intentionally so. Of course, I’d also remembered more details – that much of the book was spent in space, with the space hotel, the astronauts, the Vermicious Knids, the return journey, arriving back at the chocolate factory, and the rescue of Charlie’s grandmother after having consumed too much Wonka-Vite. What I’d forgotten, however, was that the book was so dreadful. I should point out that the boys enjoyed listening to the story, but reading it to them proved to be difficult because of the pace of the story and the contrived and convoluted ways in which Dahl’s plot unfolded. The boys definitely felt more engaged by the first book though, as much as I hope it didn’t, it is possible that my dislike of the unfolding sequel may have had an effect on the way I read it to them. There were times when my oldest would interrupt the story at the end of a sentence to ask a question – something I actively encourage and enjoy as part of our reading experience – to help him understand what had just happened, or why a particular character had just done something. Ordinarily, a storyline will unfolds in such a logical or, sometimes, perfectly unexpected sort of way that you don’t need an explanation, but during the course of Charlie and the Great Glass Elevator, I found that there were so many interruptions and questions that it felt as though the story hadn’t been crafted with as much care and attention as Dahl’s other stories. “Why did Grandma Josephine pull Mr Wonka away from the controls, Daddy, after he’d just told everyone that he needed to watch things very carefully?” was the first of the questions, on page 19. We discussed various reasons, and while Noah thought that being in space floating miles above the earth would be lots of fun, he also thought that some people might feel scared. “Not me though, Daddy,” he was quick to add. The questions continued and it’s fair to say that some were genuinely good, helping him to understand more about things that were referenced, but the scrunched-up look of confusion on his face reflected that many of the questions were more to do with him not understanding why events had unfolded in the manner in which they had. Was it bad on purpose? And, of course, from that point on, everything became more and more unraveled. The pun-laden President of the United States of America, the seventies-era racial stereotypes (Chinese Premier How-Yu-Bin, anyone?) and the chapters that seemed to ramble on without adding anything to the story. The puns came thick and fast, most of which failed to elicit a question, let alone a response from the boys. The writing felt phoned-in, and the editing was as close as possible to non-existent: whoever edited utterly failed to point out just how bad the whole thing was. For an author who wasn’t afraid to treat his readers like adults, and who pulled very few punches in his other stories, something didn’t quite feel right. Perhaps, and this is complete conjecture, it was dreadful on purpose. Dahl is known to have disliked the 1971 film Willy Wonka and the Chocolate Factory, starring Gene Wilder as the titular character, so perhaps the sequel was so contrived, so manic, and set in such exotic locations to dissuade filmmakers from even considering making another film about Charlie’s adventures. We finished the story and closed the book, and my oldest frowned slightly and looked at me. “Is there another book about Charlie, daddy?” With the boys being used to having lots of stories about other characters we’ve read about, it felt like an obvious question to ask. “That’s a shame,” was the reply. “I liked the first story about Charlie better.” The frown melted away before he put his head on the pillow, yawned and thought for a second. Thankfully, Dahl went on to write some of the best books of my childhood, including Danny, Champion of the World, The Witches, Matilda and, our most recent read, The BFG. I’m happy to say that the boys loved it. Which is just as well – it’s my favourite too. If you’ve enjoyed watching the rugby over the last seven weeks, there’s a hell of a season finale shaping up in the Aviva Premiership that you might enjoy. For the longest time, I’ve enjoyed watching the Six Nations, and this year has been no different (especially with England wrapping up the grand slam), but it’s only in the last couple of years that I’ve really got into watching Rugby Union at club level. It’s not like I’ve had a real excuse – Franklin’s Gardens, home of Northampton Saints, and Welford Road, home of Leicester Tigers, are almost exactly the same distance from my front door. But, it’s hard for me to feel any affinity for any team that’s based over 30 miles away from home. That’s why it took until 2014, when Wasps announced their intention to move to the Ricoh Arena, just a few miles up the A46, for me to really start paying attention to the Aviva Premiership. Since then, I’ve attended matches, with friends and with the entire family sometimes (silly not to, when tickets for kids are free), and I’m giving serious thought to becoming a season ticket holder for the 2016/17 season. As a Wasps fan, the top of the table is very exciting and heating up nicely – I’ll visit the subject of the top half of the table properly in the next couple of weeks – but this weekend’s results have made the bottom of the table very interesting. With five rounds remaining, there’s a maximum of 25 points available to the teams in the bottom three, though given their places in the table, the only bonus points they’re likely to secure are the ones you get for losing within 7 points. Right now, mathematically, any team that wants to play Premiership Rugby next season needs 37 points though, realistically, 33 should be enough to secure a place in English rugby’s top-flight. London Irish, Newcastle Falcons and Worcester Warriors are, therefore, fighting for survival. Remember those 33 points I was talking about? Bath have just that many, and while they’re not yet assured of mathematical safety, they do have the advantage of a game in hand – their 9th round match against Sale was postponed so that their Champions Cup fixture against Toulon could take place earlier in January this year. Bath’s 150th year will certainly be one they’ll want to forget. A lucky escape last weekend gave them four points when a tired-looking Mike Delany failed to score from two drop goal attempts. A single victory from their next six games, or a loss for any team below them, is all they need to secure their place in the Premiership next season. Another team whose safety is almost certainly assured, Worcester have 30 points and will be glad that the two teams below them in the table have a head-to-head before the season comes to a close. They’ll be breathing a sigh of relief, given that they have fixtures against all four of the teams at the top of the table in their final five. Winning four from their last five games will give Worcester some confidence going into their next match, given that Irish will need to score as many points as possible from their remaining fixtures. After that, however, it’s going to be pretty tough for Worcester to get many points in any of their last four games. Thankfully, for Warriors fans, the real fight for survival is between Falcons and the Exiles. Unfortunately for Falcons, their remaining fixtures make for sobering reading, especially on the back of their most recent loss, stemming from two agonising missed drop-goals against Bath. Despite only narrowly beating Newcastle back in February, Wasps’ relentless dominance will be hard for Falcons to resist. Yes, I’m a Wasps supporter, but I don’t think anyone’s realistically expecting the Falcons to get any points from this fixture. Assuming a loss to Wasps, Falcons will go into this with five defeats on the bounce, against a Quins team that have won just one in their last four games, albeit with a home advantage. Taking four points is not impossible for the Falcons here. For Newcastle, having the home advantage in this match is huge, as it’s potentially the game that will decide which team stays in the Aviva Premiership next season. Falcons will have a tough job with this fixture, and taking even a losing bonus point home from this fixture seems highly unlikely. If the relegation hasn’t been decided before this game, the Falcons might have the edge, given London Irish will be facing a Wasps side looking to confirm their place in the playoffs. Falcons go into the final five games with a 5 point advantage over the Exiles, which might just prove to be crucial. The Exiles have a real fight on their hands, but they also have a set of fixtures featuring games that they can realistically win. The Exiles showed that they can play good rugby – their fixture against Saracens a couple of weeks ago in New Jersey was only really lost in the last 10 minutes – and the fixture is much more important for London Irish than it is for the Warriors, so there’s no reason why they couldn’t take four points from this fixture. A tough one to call, but with the home advantage, the Exiles could use this match to turn up the heat on the Falcons ahead of the game that will play a crucial role in deciding their fate. Again, it wouldn’t be impossible for Irish to get four crucial points. This is the most important game for London Irish, given their following fixtures. If they lose this match and Falcons are ahead on points, this could be the end of the Exiles’ tenure in the top flight of English rugby. Depending on the results of previous games, Irish would need to pull out all the stops at this game. Even then, it might not be enough, after the drubbing they received at the Stoop in December, when Quins beat them by 31 points. If their current form continues to the end of the season – and I’m very much hoping that it does, as I will be there cheering them on – then Wasps could be looking to make this their penultimate game of the season by securing a home playoff spot. As for the relegation battle? If you’re a Falcons fan, you have my condolences, because I think your team has the toughest battle on their hands. Whatever happens, the last few weeks are going to make for some very interesting watching. If you enjoyed the Six Nations, there’s never been a better time to dip your toe into the club competition. Side projects, a lack of sleep, and being the father of three boys means that I don’t have as much time as I’d like to think I have. I’m feeling a little out of sorts. Christmas, the new year, various birthdays, planning a trip to Italy later in the year, finishing off two websites for friends and family, and – let’s not forget – the day job, have all combined to make the first seven weeks of this year a complete blur. It’s all too easy to say yes to everything, especially when friends and family are involved. You don’t want to disappoint them. But saying yes to too many things can catch up with you and create a perfect storm of late nights and early mornings. The last couple of personal side projects have just come to an end and, while it’s important for me to keep on top of things for the health of my career and my interests, it’s also really important to remember to stay on top of my health. We’ve been relatively lucky with the sleeping patterns of our boys, of late, but five and a half years after the birth of our first son, my constant yawning reminds me that I still haven’t paid off all of my sleep debt just yet. So, in order to make sure that I can still do a good job during the day, and to ensure that I can still have fun contributing to side and personal projects, I’m going to say yes to far fewer things. After all, it’s not just me I have to think about. Pixar have always been good at getting an emotional response out of me from their movies. Their latest two prove, at least with me, that the trend is set to continue. New year’s day comes with a recently-minted tradition in our household, where the boys (of cinema-going age) and I go to our local cinema in Leamington and watch a film together. This year, we went to go and see Pixar’s latest, The Good Dinosaur. Sure, the somewhat-overused dead parent trope is a little contrived, and I saw it coming a mile away, but the relationship that forms between Arlo, the titular dinosaur, and Spot, the human child he encounters throughout the course of the film, was heartwarming. The film certainly won’t win awards for originality or story – though it may well for its utterly stunning visual effects – but Arlo and Spot’s journey, and the way the two communicate without much in the way of dialogue, made for a fun afternoon. The visuals, score and emotional tugs appeared to be perfectly timed and at various points after the duo begin their journey, I found myself wiping tears from my cheeks. By the time the credits were rolling, my face was wet with tears – as were the faces belonging to other parents and grown-ups in the auditorium, who were caught off-guard as much as I was by the sudden switching on of the lights – and I found myself shepherding the boys and I from the cinema trying (and possibly failing) to disguise the fact that I’d been weeping for much of the last 45 minutes. Two days later, Pixar would mount a second offensive on my tear ducts. Ater a particularly early start on a Sunday morning, the boys and I sat down to watch Inside Out, which had been sat, unwatched, on the Apple TV for a while. The boys and I enjoyed the movie – more so than The Good Dinosaur, in my case – but, once again, towards the end of the film, I found myself with tears rolling down my cheeks. At least, this time, I was relatively safe in the confines of my living room. It’s not unusual for me to shed a few tears while watching an emotional film – I make no secret of that fact – but, since becoming a father, I seem to be experiencing the emotional overloads even more, especially at Pixar movies. Monsters, Inc., Finding Nemo, Ratatouille, WALL-E and Toy Story 3 all had a similar effect on me (as did Big Hero 6, but we’re talking about Pixar movies here), but the winner, by a clear margin, is Up. If there’s a record for quickest route to tears, it’s surely set by Up. We’d sat down to watch the film while on holiday in 2010, and we’d been given fair warning of the emotional onslaught we were about to encounter. The beautiful sequence starts with Carl and Ellie getting married and, minutes later, you’ll be sat watching the introduction fade to black, snuffling and watching through welled-up eyes. 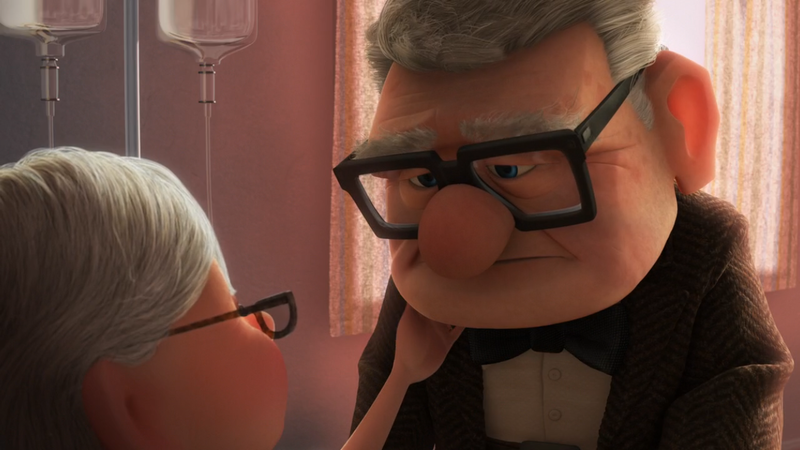 You might not be as much of an emotional mess as I am around films, but if you’re not even a little bit sad after 11 minutes of Up then, quite frankly, you’re dead inside. For the most part, Pixar have been very good at storytelling. There have been a few missteps along the way, sure, but they’re masters of their craft. That and making me cry, it would seem. © Anthony Williams. All rights reserved. Anthony Williams Blog at WordPress.com.